The student speaker for the 2018 SPSCC Commencement is Senator of Diversity & Equity Affairs Danny Case. Case will tell the transformative story of his journey of academics and sense of self since childhood, including the impact that SPSCC had on him. 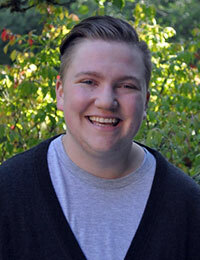 While at SPSCC, Case has been highly involved in the Diversity, Equity & Inclusion Center and served on the Student Senate as the Senator of Diversity & Equity Affairs, focusing on gender inclusivity on campus. His efforts include a revamp of the process for students to change their preferred name and gender and new signage for gender inclusive restrooms across the Olympia and Lacey campuses. In 2017, Case was invited to speak at the Artist & Lecture Series’ VIP dinner with Jennifer Finney Boylan to share his coming out story and commitment to serving the LGBTQ+ community. Case will graduate with an Associate in Arts Direct Transfer Degree and a new wife, whom he found here at SPSCC. He plans to enter the workforce this summer and continue finding ways to advocate for the LGBTQ+ community before pursuing a bachelor's and master's degree in the future.